Tickle your taste buds with this delicious fruit smoothie! I was able to procure peaches for the first time this season at the farmer’s market today. I’ve been eagerly awaiting their arrival because I love peaches and have been waiting to make this smoothie recipe. This recipe was inspired by a comment on my Pretty Peachy Smoothie by Mary (thanks!) who informed me that peaches love ginger. She’s absolutely right and I can confirm it myself. I’ll definitely be making this again. Ridiculous deliciousness aside, peaches offer some nice health benefits. They’re high in potassium, antioxidants, phytonutrients, and are a good source of beta-carotene, vitamin C, and dietary fiber. Combined with blueberries, ginger, the healthy fats found in coconut oil and you’ve got a nutritional powerhouse. Think free radical squashing antioxidants galore, anti-inflammatory action, immune system function boosting, and anti-cancerous effects. Besides having it for breakfast or as a meal replacement, you could serve this for dessert or to picky kids. Maybe even freeze and make smoothie popsicles. Yes, healthy food and drink can taste great as this smoothie is clear evidence of. Enjoy! Place all of the ingredients into your high-speed blender and blend for around 30-45 seconds or until nice and smooth. Note, if you don’t have a very powerful blender you might want to blend everything except the coconut oil first, then drizzle it on and blend for another 5-10 seconds to avoid clumping. 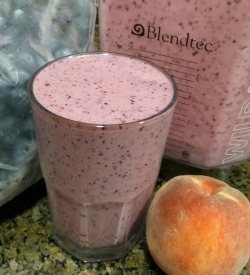 I’d love to know if you tried this peach blueberry smoothie – please do tell in the comments below. Happy Blending!